Secluded, self-contained Lake Macquarie accommodation in a luxurious bed and breakfast nestled in the foothills of the Watagan Mountains. 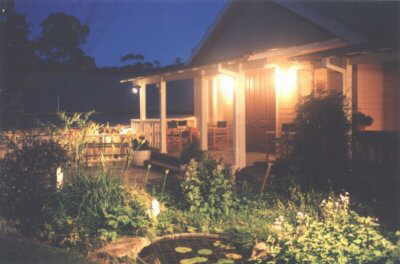 Kemeys Mountain Hideaway at Lake Macquarie has several guest rooms in a private wing of a large family home, offering visitors a high standard of Watagan Mountains bed and breakfast accommodation. Just fifty minutes up the freeway from the northern Sydney suburb of Wahroonga, nestled on the edge of the Watagan Mountains. This unique Lake Macquarie property of forty-three hectares is set in a secluded valley with tall open eucalypt forest, rainforest, Australian Cedars and abundant native birds and wildlife. At Kemeys, enjoy the tranquility, take a pleasant bush-walk, play tennis on the mod-grass court or explore the numerous roads, trails, lookouts and picnic areas of the vast Watagan and Olney forests. Alternatively nearby in Lake Macquarie, go horse riding, sailing, fishing, surfing, golfing and if this is not enough try wine tasting just forty minutes away in the famous Hunter Valley wine region. If you can tear yourself away from this quiet haven, nearby is the beautiful Lake Macquarie, Australias’ largest saltwater lake, or the Munmorah State Recreation Area with spectacular, remote, scenic beaches and lakes. Kemeys Mountain Hideaway at Lake Macquarie enjoys north facing forest views, king size double or king size single beds, generous en-suite bathrooms with two person spa and a separate shower. Adjoining, for your exclusive accommodation comfort, is a private cosy lounge, with slow combustion fire, air conditioning and dining area with kitchenette. Grab the best deals on spare parts, automotive retail group. Hurry up!